Hotel & Motel Management covers in-depth news, analysis, trends, and people from all levels of hospitality operations—from the corporate level to the property level. Hotel Design celebrates the design excellence of hotels, resorts, lodges, and destination spas. Vivid photography, creative layouts, and descriptive writing help present to the reader a broad focus on the new styles and fashion trends emerging in furniture, fixtures, and the lodging spaces that provide a foundation for creativity. Hotel Design aims to be the source of inspiration for the individuals who make it happen. Home Media Magazine is the premier home entertainment business publication, designed to inform, educate and facilitate communication among content owners, packaged and electronic distribution channels, and all other parties involved in the home entertainment marketplace. Home Media Magazine delivers news, analysis, market research, product reviews and marketing updates to give studio executives, retailers, distributors, technology providers, marketers and suppliers of ancillary products and services a one-stop resource to help grow their businesses and increase profits. Launched in 1916, Pit & Quarry magazine serves the multi-billion-dollar aggregates mining industry. Pit & Quarry offers its readers informative articles about the equipment and technology used by producers of crushed stone, sand, and gravel. Espaces magazine proves its credibility with content that is intelligent, critical, and relevant to readers who love the outdoors, adventure, and reflection, and who are enthusiasts of several activities and life experiences. With a finger on the pulse of the adventure, outdoors, and travel milieu, Espaces satisfies reader curiosity, helping them go beyond established borders by exploring new horizons with sound advice and a call to action. The Next Step Magazine covers college planning, career choices, and life skills for life after high school. The Next Step is published five times every school year in September, November, January, March, and May. Verified Audit Circulation has released the initial round of Integrated Media Audit Reports for Questex Media Group. The reports include measurement of the integrated audience across all engagement channels—print, online, e-newsletters, events, and webinars. The reports also include website activity for a six-month period. "We are pleased to now share the integrated audience audit with our marketing clients," said Tony D'Avino, Executive Vice President of Questex Media Group. "It is no longer enough for media buyers to simply evaluate and choose between competing print media based on traditional print metrics. In a multi-channel world, B2B companies must first seek to align marketing investment where their customers and prospects are spending their time. As media partners, we have to generate the insights that can power that kind of analysis." Providing both duplicated (gross) and unduplicated (net) reach for a single issue/day/period, the reports illustrate the sum of a publisher's touchpoints with their audience as well as the unique audience. The report dives in more deeply and breaks down the audience by business/industry classification, giving a more complete picture of its makeup. It answers the important questions and shows who the audience is, how they are engaged by the brand, and through which channels they are engaged. "In this increasingly diverse media landscape, the objective of the integrated media audit is to aid publishers in demonstrating the total scope of their brand reach," said to Tim Prouty, Verified's CEO. "The integrated media report will emerge as a standard for audit reports in short order once advertisers see the wealth of information provided." "As we move into the future we see only an intensification of innovation," continued Prouty. "Verified will be ready to meet those demands as mobile, tablet and, other emerging technologies offer publishers additional opportunities to reach their audience." The September 2009 Integrated Media Audit Reports are being released for the following Questex media brands: Hotel & Motel Management, Hotel Design, Nightclub & Bar, GPS World, LPGas, Response, Pit & Quarry, Travel Agent, Pest Management Professional, and Landscape Management. The December 2009 Integrated Media Audit Reports are being released for Golfdom, American Spa, and American Salon. Questex Media Group is a global, diversified business-to-business media organization serving multiple industries, including hotel and hospitality, travel, technology, beauty, spa, among numerous other specialty industries with its well-established, market-leading events, publications, digital and interactive media, research, and other marketing and media-related services. The company's combined operations include approximately 400 employees in offices throughout North America, South America, Asia, and Europe. News Corp. has begun rolling out paywalls for its precious online news, but content at The Wall Street Journal recently became free for a day to anyone who wanted to consume the publication's news and exclusive features. The free day of browsing, sponsored by Acura, could become an interesting business model that not only gives prospective subscribers an inside look at the publication's content, but an incentive to sign up and buy. An ad on the home page read: The Wall Street Journal Online is Free Today. Explore the entire site and all its exclusive features. The sponsorship demonstrates an interesting twist for publishers and brands looking for another outlet to reach consumers. If online publishers decide to put up a paywall, they simply sign on a brand to sponsor a free day of browsing. Online publishers don't care who pays for access to the content, as long as someone does. "It's a smart move by Acura because it gives them another touchpoint to reach consumers," says Robert Passikoff, founder and president of Brand Keys, a New York-based marketing and research firm. "It also proves Acura's brand value aside from being a car company." During an earnings call Tuesday with investors, News Corp. Chairman and Chief Executive Officer Rupert Murdoch reaffirmed the company's online pay strategy, stating that News Corp. publishers will charge for content. "We'll be charging for online wherever we have publications," he says. "Consumers are willing to pay to be entertained and informed." Murdoch says News Corp. has entered into discussions with other media companies, all of which have turned to the media mogul for ideas. News Corp. isn't the only company with this idea. A software system developed by the entrepreneurs Steven Brill, L. Gordon Crovitz and partners Press+ will allow more publishers to put up that wall. A handful of online news organizations have already signed up, reports The New York Times. The NYT, reportedly one of those news organizations struggling to find a strategy and consistent steady online income, will spend 2010 putting up a partial paywall. The Financial Times already limits the number of online articles people can read without paying, even if they register with the site. According to a recent Adweek Media/Harris Poll, 23% of adult Americans believe that newspaper and magazine advertisements are where they can find the best bargains. 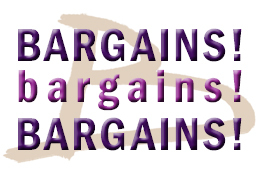 18% believe online advertisements are most likely to help them find the best bargains. 10% say direct mail and 12% catalogs, 11% television commercials, and just 2% say radio. And 34% of Americans believe the type of ad makes no difference when they are looking for the best bargain. Among the genders, women are more likely than men to say newspaper and magazine advertisements, and direct mail and catalogs are more likely to help them find a bargain. Men, on the other hand, are more likely to say online advertisements are more likely to help them find a bargain. One-quarter of those with a high school education or less say newspaper and magazine advertisements are more likely to help them find a bargain, compared to 20% of those with at least a college degree. The report concludes that, while newspaper ads are still slightly ahead of others among all adults when it comes to bargain hunting, online is not far behind. Also, online ads lead newspaper and magazine ads as a source of information about bargains among younger, better-educated consumers—which is who most advertisers are interested in. 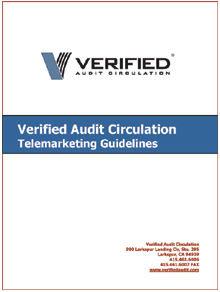 Verified provides a booklet that outlines Verified's regulations regarding telemarketing. This guide is intended to provide operating guidelines for the acquisition and requalifications of direct request from recipient and direct request from recipient's company subscriptions through the use of telephone interviews. The guide includes sample scripts, audit requirements, and personal identifier information. The guide is available on Verified's website at www.verifiedaudit.com or by clicking the image to the right. If you have any questions regarding telemarketing, please contact Verified at 415-461-6006. � 2009 Verified Audit Circulation.